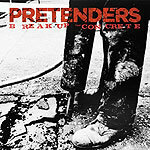 CD review: "Break Up the Concrete"
This review first appeared in Turbula in October 2008. Whatever group of musicians Chrissie Hynde has assembled under the title the Pretenders, what's always defined her best music is a finely honed balance between attitude and art, passion and restraint, chaos and order. It's a balance that is never quite stable, held together only by Hynde's force of will. That balance is even more finely achieved on the latest release, "Break Up the Concrete." "Don't Lose Faith in Me," an almost dirgelike slow rocker, is one of the best songs Hynde has given us. While her vocals are slow and carefully controlled, there is also a nearly unbridled passion beneath the surface of her singing (and the band's playing) that threatens to break through at any moment. On the opening track, "Boots of Chinese Plastic," Hynde and the latest incarnation of the Pretenders show they can still rock out as hard as the band did 25 years ago. "Break Up the Concrete" is even more of a time capsule: a minimalist two-chord rocker that hearkens back to the band's proto-punk roots. And "One Thing Never Changed" shows (again) that Hynde is one of the most hauntingly expressive of all rock singers, putting an ache into her voice that most country and jazz singers will never be able to touch.